The spaceship Godspeed is on a 300-year journey across the stars to form a new settlement on Earth-Centauri. Amy has been cryogenically frozen with her parents to awake once the journey is completed, but something has gone wrong and she's awoken 50 years too soon. Someone is deliberately unplugging the cryogenic containers, and it's up to Amy to find out what's happening before the killer strikes again. The civilization Amy finds on Godspeed is nothing like what she's left behind. Her pale skin and red hair make her a target on the “mono-culture” ship where almost everyone looks and behaves alike. Her first friend is Elder, the only other teenager on the ship, and the person being trained to become the next leader. His mentor, Eldest, is the despotic leader who rules Godspeed through strict hierarchy. Eldest has divided the ship into three levels. The Keeper level is for Elder and Eldest alone. The Shipper level is where the research labs and engine rooms exist. Finally, there is the Feeder level, where most of the Godspeed inhabitants live in farms raising food and the basic stuffs upon which the ship depends. But in the 200 years since the ship has left Earth, more has changed --- or been hidden and forgotten --- than its inhabitants realize. Amy is sent to the Hospital wing with the rest of the ship’s inhabitants who appear different. But by her earth-born eyes, it's the Feeders who seem strange, not the hospital teeming with brilliant minds and bright artists. As Amy struggles to acclimate herself to claustrophobic life aboard ship, she discovers other things that don't seem quite right. How much time has passed since Godspeed left earth? Why has earth's history --- found in the hall of records --- changed so much from what she knew? And how did Godspeed come to be organized in this strange new order where almost every aspect of their lives is strictly regimented and arranged for them by Eldest? 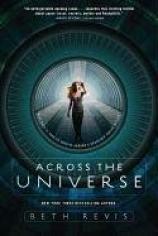 ACROSS THE UNIVERSE is Beth Revis’s debut novel. Marketed as "science fiction for teens who don't like science fiction," it contains touches of Kurt Vonnegut's HARRIS BERGERON and Aldous Huxley's BRAVE NEW WORLD. Revis takes on a number of current-day ethical issues, including genetic and chemical manipulation, but falls short on some of her facts regarding the basic physics of space and space travel. As Amy begins to unlock the secrets of Godspeed, the more surprising the scenario becomes --- including the book's final reveal about where they are and how long they have been traveling. "The first cause of discord is difference. There is no religion on Godspeed. We all speak the same language. We're all mono-ethnic. And because we are not different, we do not fight. Remember the Crusades I taught you about? The genocides? We will never have to worry about those types of horrific events on Godspeed..."
At first look this may seem like a utopia, but the more Amy and the reader explore the ramifications of this theory --- down to altered Earth history uncovered in the hall of records designed to support this theory --- the more sinister it becomes. Hitler is revered as a hero. And Lincoln is remembered for sending the slaves back to Africa. Neither of these things is true in Amy's world or our own, but both seem chillingly similar to some of the strange alternate-histories and conspiracies that run rife in our world. The second cause of discord is a lack of a strong central leader, which the Eldest/Elder system was designed to eliminate. The generations on Godspeed are carefully controlled, with each generation coming into Season every 20 years. Each generation's Elder is born between generations. "One person," Eldest explains to Elder, "born ahead of the people he will lead, to act as patriarch and commander to the people younger than he... You will be the strong central leader who prevents discord, who preserves every living person on the ship." Finally, the third cause of discord, which Elder and Amy discover throughout the course of the novel, is individual thought. The civilization inside Godspeed is designed to control and contain it. And when we find out why, it's almost easy to see how these three rules have become so important to the people on the ship, even if this philosophy threatens to crush the last vestiges of beauty and autonomy that live upon it. ACROSS THE UNIVERSE is beautifully packaged with a map of Godspeed on the reverse of the book jacket and online add-ons for interested readers. The author is engaged and enthusiastic on her topic, and the novel is sure to enthrall those who are interested in something beyond the current craze for supernatural romance. While Amy and Elder's interactions are relatively PG, there are some fairly charged scenes involving the ship's mating Season. This aspect of sexuality, in addition to some of the book's treatment of topics like government control of medication and birth control, including one suicide, means that ACROSS THE UNIVERSE is probably best for mature teen readers.